Wedding Dance Lessons? Relax Grooms We Have You Covered! Your future bride wants you to take wedding dance lessons, and like most grooms this part of the wedding planning is the most agonizing aspect yet. Before you throw your hands up in protest and declare that you are a man's man consider this; it is more common than uncommon for grooms to take dance lessons. 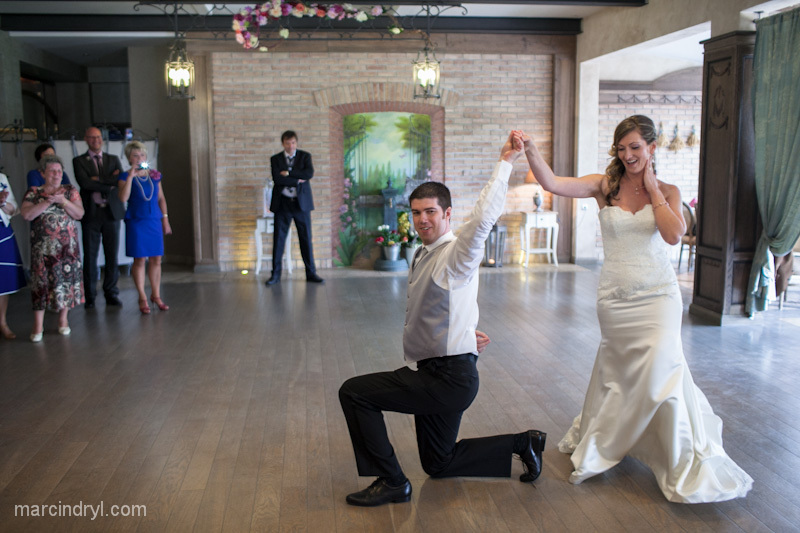 Many grooms realize they are not exactly a natural at dancing, and that the two left feet syndrome effects them. Now you could urge your bride to scrap the dance completely thus avoiding embarrassment, but you would have a better chance of winning the lottery than that happening. The first dance is as iconic in weddings as the ceremony itself. What you can do is find a dance studio that can customize your special moment, complement your dancing ability, and make it as unique as you and your bride. At Quick Quick Slow for example we offer a variety of packages to fit your wedding needs. If your two left feet syndrome is worrying you, we can create something fun and new. There is nothing in wedding etiquette that demands you and your bride only preform the Waltz (unless you want to). In fact fun and funky is gaining momentum according to TheKnot.Com and a personally choreographed fun and funky dance can accomplish multiple things and make the moment even more special. First and foremost fun and funky can either cure or hide those two left feet. Once that has been accomplished it can also be as "Manly" as you want it to be. At Quick Quick Slow we encourage you and your wife to bring the joys and humor of your relationship into your dance. Subtle or not so subtle movements can convey the best elements of who you two are. We suggest incorporating inside jokes that will entertain your family and friends, or replay the story of your love. This unique routine can flow over into a further choreograph of the father of the bride/mother of the groom and bridal party dances as well. Thus painting a complete picture for the guests. Of course if you two want your first dance to be more traditional that can be done as well. Quick Quick Slow offers choreographed traditional also. Perhaps a subtle Waltz to bring a tear to every guests eye? Does this idea sound intriguing but those two left feet still worrying you? We can work with you and offer special tips and tricks to manage those two left feet. We can also provide as much one on one teaching as needed to eliminate them completely. If both of these concepts sound like perfect potentials but you and your bride can not decide, allow us to mix it all together into a personalized wedding experience. Start fun and funky or slow and traditional, bring in the wedding party and mix it up, then awe guests with yet another change up for the mother of the groom/father of the bride dance. Create a complete theme that matches your wedding theme. No matter what the two of you choose, your personalized dance experience will have your guests talking about it for years to come. What can be more "Manly" than that? Please feel free to contact us with any questions and requests. We are here to help no matter how simple or outrageous the question or request may be. Our goal is to make your wedding experience (including planning) as fun and meaningful for both you and your future bride.